Solar power projects are one of the biggest opportunities for investment in Africa. With more than 600 million Africans living without electricity, there’s a clear need. But there isn’t a clear path. Even though Africa is the most sun-rich continent in the world and pricing on new electricity generation is reaching record lows, limited financing and lack of government support have stood in the way of development. This gridlock has been a challenge for overseas investors and developers to crack. Since 2014, the team behind Access has been building decentralized financial infrastructure, off-blockchain, in Ghana and Senegal by joining forces with on-the-ground agents who are already banking communities. In 2016, we launched Atlas, a simple mobile banking app, by partnering with local, on-the-ground banking agents. Through a network of 500 banking agents, we’ve scaled our weekly active user base to 30,000 people who trust us for financial services. In 2018, we recognized an opportunity to expand upon our early market adoption. Using blockchain, we’re building an ecosystem called Access Network for investors and developers around the world to reach users in West Africa and beyond. Access will make it possible for overseas contributors to offer micro-loans to users, among other financial services. 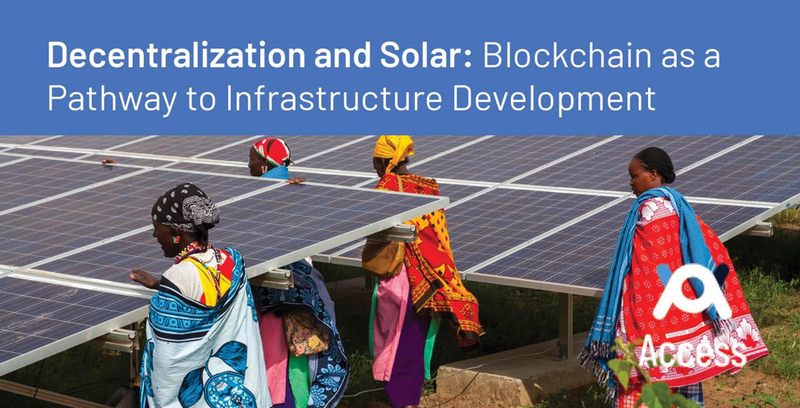 These same financial pathways, on blockchain, make it possible to invest in infrastructure development, such as solar. Decentralization makes it possible for parties to team up, without middlemen or third parties. Through Access’s ecosystem, communities will be able to take solar development into their own hands. And ultimately, reap the rewards. Perspectives on the Ground: Why Blockchain? While blockchain technology is new to Africa, its premise isn’t. Smart contracts capture basic human decision-making, creating a degree of trust and transparency into resources. Tokenization brings liquidity and assigns value to assets that include solar panels. Smart contracts enable the expansion of token economies into new areas of adoption. In many African rural and urban communities, users face high electricity costs for sub-par and unreliable service. From clean manufacturing operations to solar farms and data centers, demand for new infrastructure is strong. But coordination is the biggest problem. Even when a big initiative gets started, lack of trust may cause it to fall apart. There’s always a fear that people are taking advantage of others. As a result, many entities struggle to move initiatives forward. Co-ownership models avoid this gridlock, altogether. It ensures that as users pay for the use of the service, they’re also on a path towards owning their own stable, dependable infrastructure. Consider the story of Meki, for instance, a local mayor in Senegal. Meki has lived in his community for a long time and receives widespread trust. If he’s spearheading a project, people feel good about it and are willing to put in work. His vision? He wants to build a clean data center that is solar-powered and built by women. Investment from overseas will only work in partnership with community leaders like Meki. On the flip side, Meki needs overseas investment to execute on his vision. Co-ownership, powered by blockchain, is the mechanism for getting solar initiatives off-the-ground. Access is seeking qualified partners and investors who are interested in running contained solar pilots– forming local partnerships with contractors and assessing maintenance costs and payback periods. Please contact karissa@atlas.money if you are interested in participating, advising, or partnering. This work was a collaboration between the entire Access Network team, ranging from the CEO to CTO, COO, Chief of Staff, and other members of leadership. Emily Burchill, Shannon Wu, Ritika Puri, and Karissa Domondon created this story.